Dynamic speed feedback sign (DSFS) systems are traffic control devices that are programmed to provide a message to drivers exceeding a certain speed threshold. 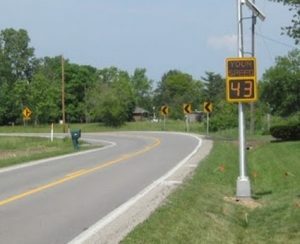 A DSFS system typically consists of a speed-measuring device such as a loop detector, radar, or message sign, which displays feedback to drivers who exceed a predetermined speed threshold. The feedback may be the driver’s actual speed, a message such as SLOW DOWN, or activation of a warning device (such as beacons or a curve warning sign). A study by Hallmark et al. (2015) evaluated the effectiveness of two different types of DSFS systems in reducing speed and crashes on rural two-lane curves in seven states (including Iowa). 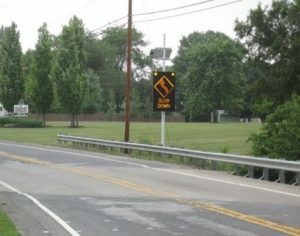 One sign displayed a regular speed feedback sign when drivers exceed the posted or advisory speed and the other displayed the corresponding speed advisory sign when the driver exceeded the posted or advisory speed. Signs were installed at 22 curves on rural two-lane roads in each of the seven states. Large reductions in mean and 85th percentile speeds were noted at most sites. Significant reductions were also found in the fraction of vehicles traveling over the posted or advisory speed limit.